The U.S. Army Corps of Engineers plans to hire private companies to finish restoration of the Birds Point levee. 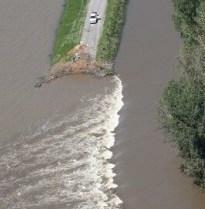 The corps set off explosions at three spots on the levee last May to relieve pressure on the floodwall in Cairo, Ill. The corps halted its floodway repairs in December after spending $20 million to shore up the levee to 55 feet of flood protection at each of the blasting spots. The Southeast Missourian reports the corps will be looking in the next two weeks for three firms to bid on the projects. The project engineer says the private companies will bid to work on each breach. He said private firms are being brought in because of the large number of projects the corps is facing.